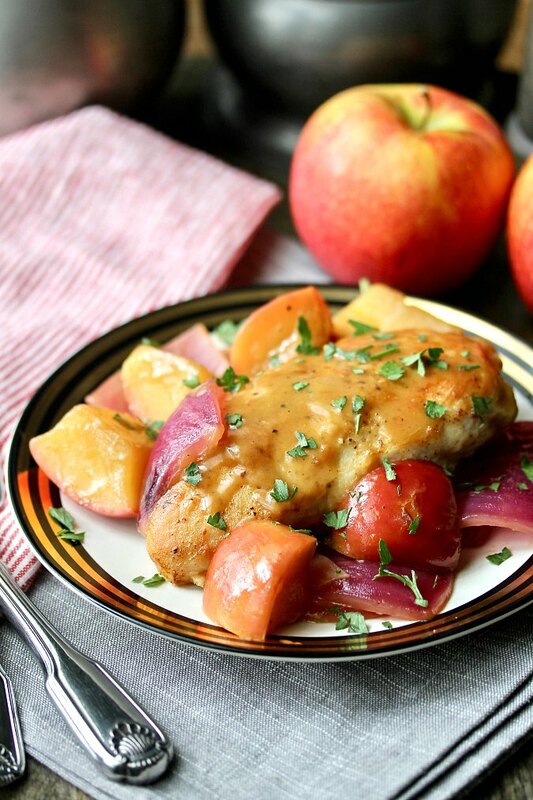 This chicken with apple, onion, and cider sauce dinner takes just about 30 minutes to make. 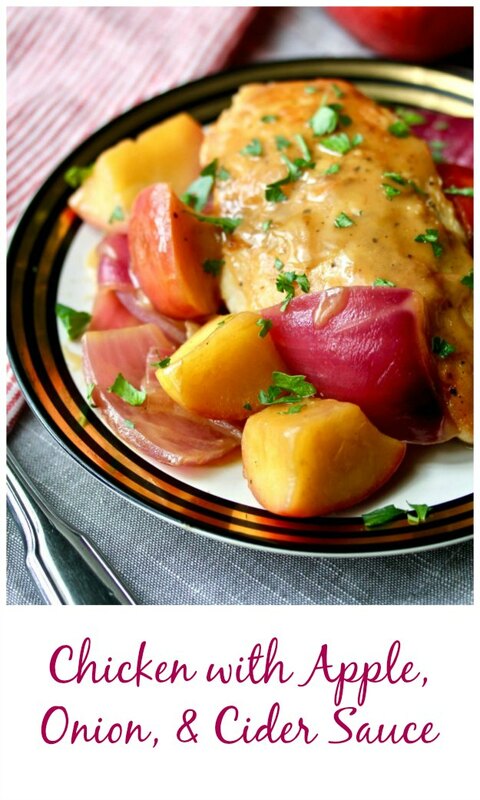 You will completely fall in love with the cider sauce with its concentrated chicken and apple flavors. 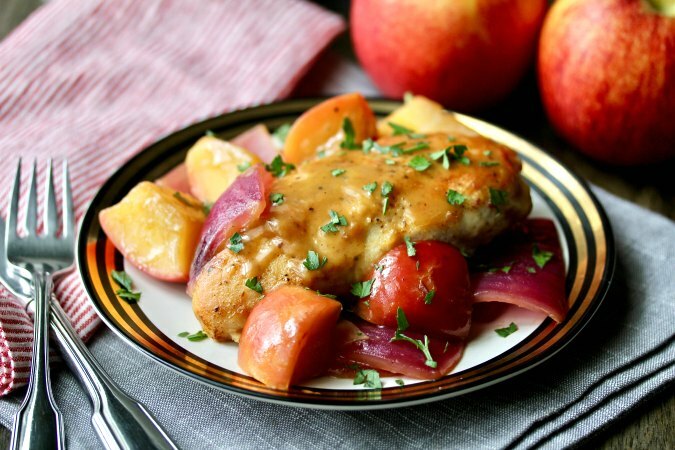 This chicken with apple, onion, and cider sauce is a great weeknight meal for a busy family, and tastes like it took a lot longer to prepare than just 30 minutes. I love the combination of the apples and the onions along with the chicken broth and apple cider sauce. The flavors are concentrated, a lot like a demi-glace. In fact, I added some Better Than Bouillon chicken base to the broth to make it even more "chicken-y." One of our Apple Week sponsors, Swiss Diamond, sent me this gorgeous nonstick fry pan, which I used to prepare this recipe. The cooking surface of this pan has a diamond-reinforced nonstick coating. 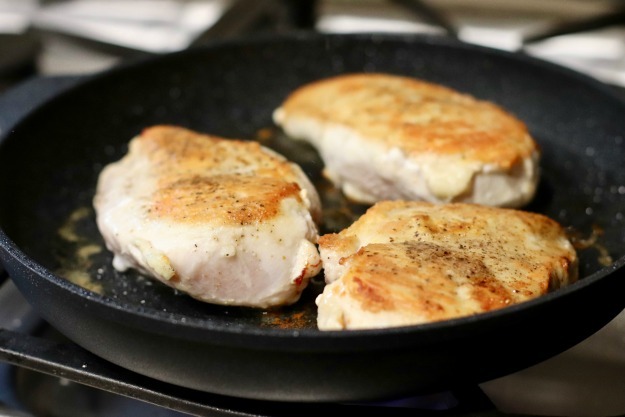 The cooking surface is both durable and PFOA-free, and the handle can withstand oven temperatures of up to 500 degrees F.
I was able to brown the chicken nicely, and then use the same pan to cook the apples and onions, and then develop the sauce while the chicken baked in the oven. If you'd like to win a 10-piece set of these pans, be sure to visit my Apple Week Kick-off post right away and enter! I wish I could! This dish was a huge hit in my house. I do have a few taste tasters who have an "attitude" about red onions, but even they loved this dish, onions and all. 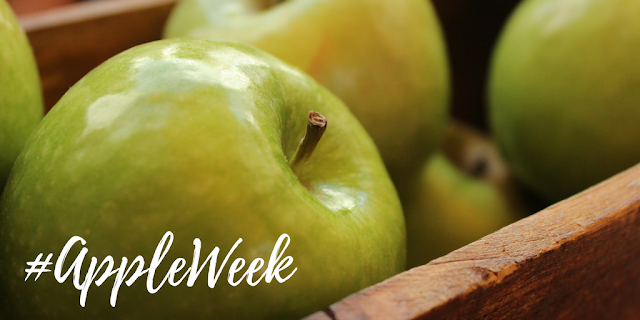 After the recipe, be sure to check out the rest of the AppleWeek recipes from all of my food blogger friends. And do not forget to enter to win a 10-piece set of Swiss Diamond cookware by visiting this post and scrolling down to the Rafflecopter form. You want this cookware set! Season the chicken breasts with salt and pepper and coat them with flour. Shake off any excess. Heat a 12 inch skillet over medium heat and add 2 tablespoons of vegetable oil. When the oil is shimmering, add the chicken, and cook until golden brown, about 5 minutes a side. Transfer the chicken to a baking dish and place them in the oven for about 8 minutes, until cooked through. Meanwhile, add another tablespoon of oil to the pan, and add the onions and apple. Increase the heat to medium-high and cook, stirring regularly, for about 2 minutes. Add the vinegar and scrape up any browned bits with a wooden spoon. Let the mixture boil for about a minute. Add the chicken broth and optional chicken base, and bring to a boil. Cook until the broth reduces by half. Remove the pan from the heat and stir in the butter. Season with salt and pepper. Remove the chicken from the oven and place each one on a dinner plate. Add the apples and onions, and spoon the sauce over each piece of chicken. Sprinkle with the parsley. Looks very good. The apples and onions are completely uncooked? They seem to be cooked in the photo but no mention of any cooking in the recipe. I want to give this a try tomorrow. Hi Dave, see step 4 in the recipe. the apples and onions are cooked in the pan while the chicken bakes in the oven. Let me know how you like it! Made it for dinner tonight. Very good - excellent reviews from the entire family. Will make it again. What a lovely plate. I would love to sit down to dinner with this on the table.